Apache Kudu is a column oriented data store of the Apache Hadoop system which is compatible with most of the data processing frameworks use in Hadoop environment. 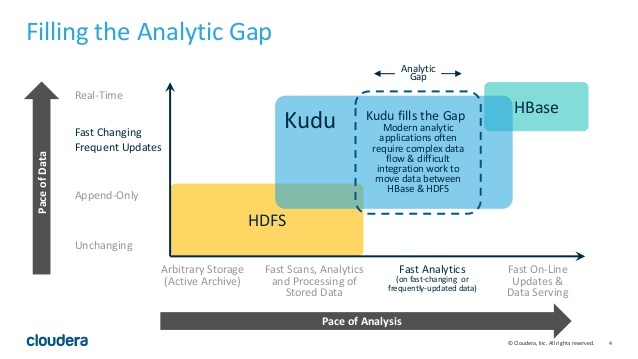 Apache Kudu provides Hadoop’s storage layer to enable fast analytics on fast data. This project originally was of Cloudera. Kudu Has Official Kudu Quickstart VM and Cloudera Users Can Avoid This Guide. Kudu is now easier to install and manage with Cloudera Manager. If you use Cloudera Manager , please refer to Cloudera ‘s Kudu documentation . Here Are the Steps on How to Install Apache Kudu on Ubuntu Server. We are publishing guide for internal reference of our website. We will install from repository. Building Kudu is complex, time taking process and factually meaningless unless you need to build with major modification. One or more hosts run Kudu masters. It is recommended to use one master (no fault tolerance), three masters (can tolerate one fault) or five masters (two faults can be tolerated). One or more hosts running Kudu tablet server — when using a copy, you need at least three tablet servers. the kudu-master and kudu-tserver packages only needed on hosts where there is a master or tserver respectively. It practically not needed while using Cloudera Manager. Each of them provides configuration files and init.d script to manage the corresponding Kudu process. Some methods can verify that the service is running — checking the output of the ps command on the server to verify that one or both of the kudu-master or kudu-tserver processes are running and/or opening the Master or Tablet Server web UI. Before you start the Kudu service, you need to perform additional configuration steps on each host. These packages create a kudu-conf entry in the operating system’s standby database, and they ship the built-in conf.dist. To adjust the configuration, you can edit the file in /etc/kudu/conf/ directly, or use the operating system utility to create a new option, make sure it is the link pointed to by /etc/kudu/conf/, create a custom configuration there. Some parts of the configuration file configuration are also configured in the /etc/default/kudu-master and /etc/default/kudu-tserver files. If you create a custom profile, you should include or copy these configuration options. We can access the Master or Tablet Server’s web UI by opening http://<_host_name_>:8051/ for master and http://<_host_name_>:8050/ for tablet servers. If Kudu is not running, please check the log file in ‘/var/log/kudu’ . If there is a file ending with ‘.FATAL’ , it means that Kudu cannot be started. Problem can be with your operating system or with ntp. Theoretical Foundations of Big Data is third and final part of our series of articles. We have talked about Data Mining, OLAP & softwares. This is Old Way of Using Tools Around Big Data and Data Science. Here are Steps on How To Install, Run iPython/Jupyter Notebook on Bluemix. Integrating Apache Nutch With Apache Solr Will Offer a Web UI, Options to Visually Search and Use Extended Functions of Apache Nutch. Here Are The Steps on How To Install SBT and Scala on Ubuntu Server. sbt is a build tool for Scala and Java projects Like Apache Maven, Apache Ant. Cite this article as: Abhishek Ghosh, "How to Install Apache Kudu on Ubuntu Server," in The Customize Windows, July 18, 2018, April 26, 2019, https://thecustomizewindows.com/2018/07/how-to-install-apache-kudu-on-ubuntu-server/.